Artist Bench by Jansen - Free Shipping is rated 4.24 out of 5 based on 55 ratings. 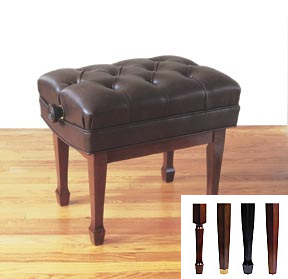 The Standard Sized Jansen Artist Bench - made for Steinway, Baldwin and Kawai. You'll always be in perfect position as long as you are seated on this bench. Used in concert halls around the world, this most traditional artist bench uses Jansen's patented micro-adjust mechanism. The Jansen bench is firmly upholstered with an elegant folded tufting and two welt borders and comes STANDARD with a SATIN finish and matching VINYL upholstery. The many leg styles, upholstery options and finish color choices make Jansen the most sought after piano bench in the world! Seat Size - 21.5" x 16.5"
Free Shipping in 48 USA States, extra shipping charges to HI, AK, and overseas destinations.